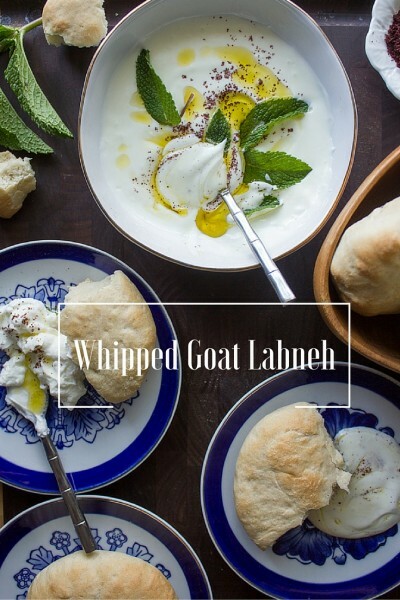 Whipped Goat Labneh for all your spreading and dipping needs!! Y’all! 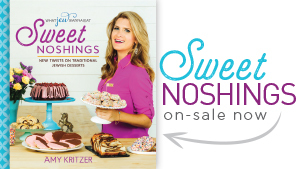 Thank you so much for purchasing and sharing about my first book, Sweet Noshings! Yay! Or if you thought about purchasing, that’s cool and beneficial too. 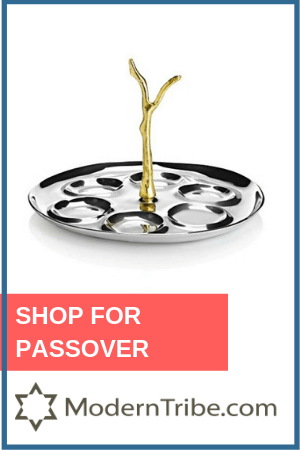 Y’all brought me to #1 Jewish cookbook, and I promptly updated my Jswipe profile to say #1 Jew on Amazon. I think it’s working. Okay, it’s almost June which means it’s almost summer which means we are approaching a good 6 months of heat or so in Texas. Which means I need some light and healthy recipes stat! I don’t have a reason, but I can’t stop eating matzah ball soup. Do I need a reason? I’m seriously eating it for breakfast, lunch and dinner. Haaalp. I guess there are worse things, but the matzah bloat is getting to me, and I have some boats to galavant on! This weekend I’m going to the Indy 500 and could not be more pumped? Have you been? Any tips? Where can I get a checkered flag onesie by Thursday?? So many questions. The answer? 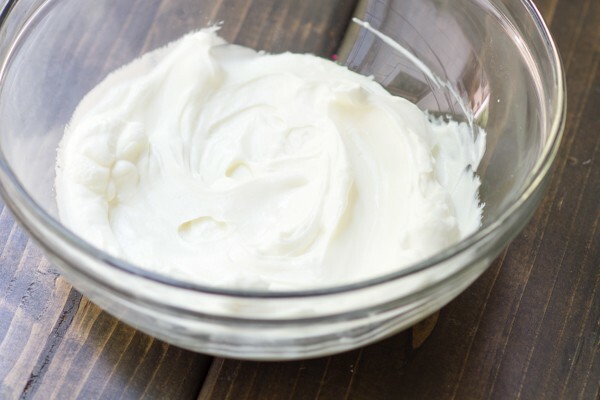 Whipped Goat Labneh. Naturally. 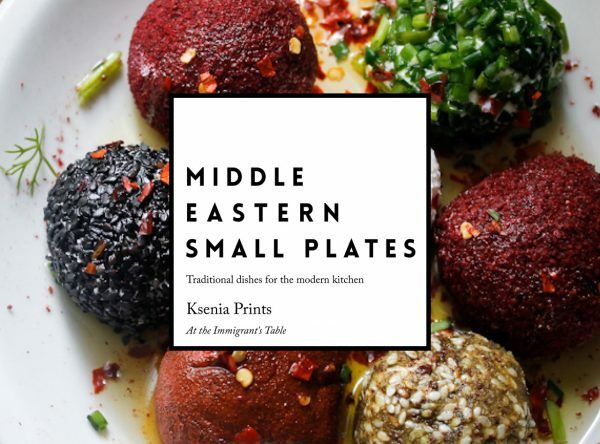 My friend Ksenia from At the Immigrant’s Table came out with a new e-book, Middle Eastern Small Plates, and I could not be more pumped. Let me share some of the recipe names. Eggplant Rolls with Feta and Pomegranate, Mushroom Bourekas, Gluten-Free Almond Lavosh Crackers. Yes, yes and yes, right? P.S.. How gorgeous is my new Mastro End Grain Cutting Board made from black walnut and maple inserts?? The recipes are vegetarian, meant for sharing, and perfect with a glass of wine. Sign. Me. Up. 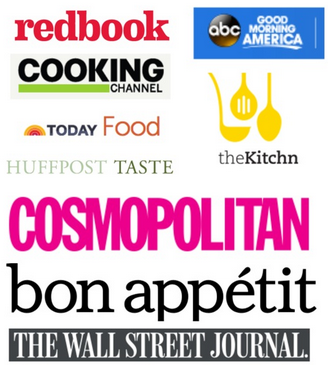 I love that they work for breakfast, lunch, snack time or dinner, (just like matzah ball soup!!) and you can make one, or all 11 if you’re having a party (or bachelorette marathon). 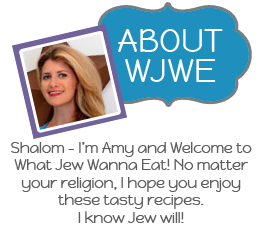 Learn more here, and get your own copy here. 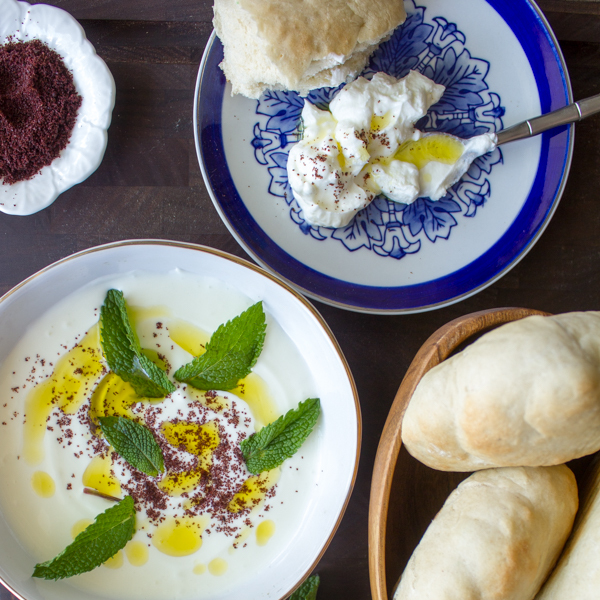 Even though every recipe looked amazing, this Whipped Goat Labneh was calling out my name. It said make some homemade pita to go with me! It said you already have all the ingredients in your pantry! So I did what I always do when food starts to talk to me, I cooked. Gluten free . Candida friendly . Diabetic friendly . Nut free . Soy free . 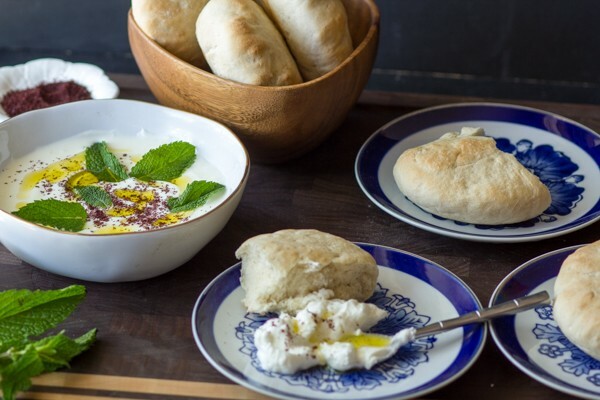 Tart and tangy, labaneh is the Middle Eastern answer to cream cheese. 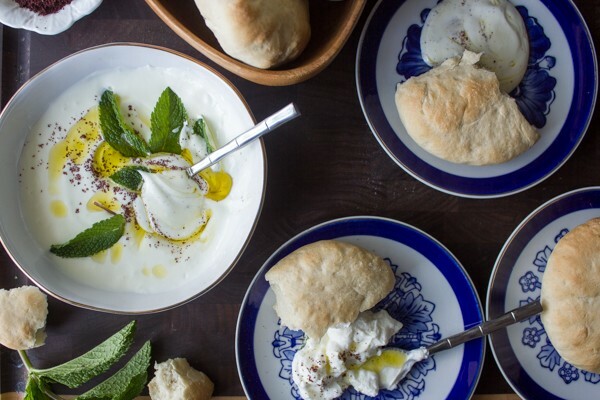 It’s incredibly easy to make from fresh yogurt - you just need some time and patience. Served with a drizzle of fruity olive oil and a sprinkling of citrusy sumac and colorful pomegranate seeds, it will brighten up any small plates table. Stir the salt into the yogurt. 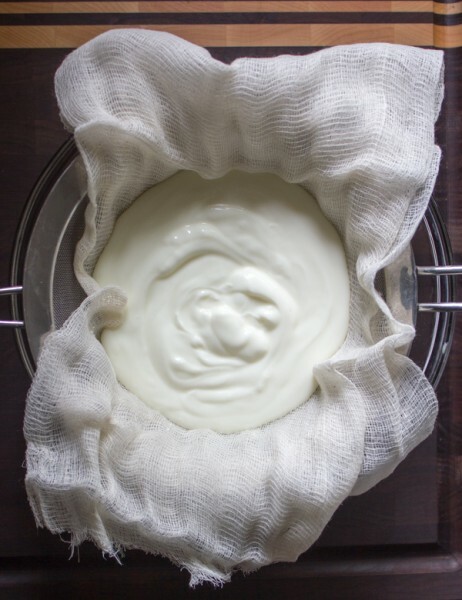 Lay out two layers of cheesecloth over a strainer, and pour the yogurt into it. Tie the yogurt in the cheesecloth, creating a little sack that can be hung up. Hang cheesecloth with yogurt to dry over a sink for at least eight hours, and up to 24 hours. On a hot summer’s day (or most days in Texas), transfer draining yogurt to the fridge after the night, and hang it in there to continue draining. To whip labaneh, place it in a cold bowl with just a drizzle of milk. (Note: I didn't add milk.) Whip with a whisk or an electric mixer until labaneh is light and airy and firm peaks form. Tip: If you’d like to sweeten the labaneh a bit, add honey before whipping it. It goes beautifully with the pomegranate and sumac. You also need 8-24 hours resting time. Adapted from Middle Eastern small place with permission. Oh! that is nice! I will have to try whipped labneh. Labneh looks fab. 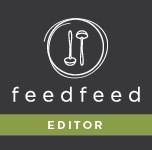 When will you have a savoury cookbook coming out- ? Noshing s’more ? Big Noshings ? When does the salt come in? Oops updated it! You can add it at the end too.